Stewart | 1001 Movies…Before I Die! A successful film often has more than one thing going for it. A charismatic star, on their own, isn’t enough to hold up a mediocre story (as much as they might have you believe otherwise). Likewise, a good story can’t endure under the weight of poor acting, and fantastic cinematography can easily translate to a beautiful yet forgettably boring film. In order to succeed, the stars have to align, talented people who share a vision have to work together, and put aside their differences to create something that transcends each of, and all of them…or it’ll fall flat anyway despite all their best efforts. The Philadelphia Story is one such film that, for me anyway, really fell flat fast. If one were to take the film and separate it into its crucial elements, talent, crew, story, director, etc., the film looks undeniably strong on paper. Unfortunately, again in my own humble opinion, it comes off as self-important, and more than a little trite not to mention, straight up boring. Rather than Cary Grant charming me with witty repartee and Jimmy Stewart making me feel as though justice has been done, I felt annoyed at each of their rather lack-luster and incomplete characters. Both are caricatures of jealous sad-sacks that are found on sitcoms. I’m afraid the jury is still out when it comes to Katharine Hepburn too. I started out this project with a healthy, natural dislike of her, stemming mostly from the film Bringing Up Baby. Then I was caught off guard by her lovely, feisty and moving turn in the film The African Queen. Now I’m afraid I’m going back to square one with my impressions of her thanks to this film. She starts off as a character that I rather enjoyed watching. I liked her and agreed with her motivations, then she was transformed into a watered down milquetoast-ish, doormat type of woman who gets on my nerves almost immediately. This criticisms are, of course, to say nothing of the fact that this film has been built up so highly from the outset. So many people consider this film a classic and treat it as such. All forms of criticism for it are too harsh, with the love story and the characters themselves being too dear to the hearts of those who enjoy it. To be fair, I am not immune to such blind loyalty. I would be utterly aghast at any criticism, and recklessly jump to the defense of a film such as, say, Total Recall. But, I mean come on…it’s Total Recall. So…the story. As the film opens, we are dropped into the tumultuous marriage of Cary Grant’s, C.K. Dexter Haven, and his fire-brand of a wife Katharine Hepburn’s Tracy Lord. The first thing we see is Dexter getting kicked out of his house by Tracy for reasons we will come to understand later. Dexter leaves, but not until getting in one last bit of domestic violence. Flash forward a bunch of (Years? Months? Days?) time and we find that Tracy is set to marry again, this time to a rather wealthy man whose new money status makes him a target for the local paper’s gossip section. A photographer and reporter team (Stewart and Hussey as Macaulay Connor and Elizabeth Imbrie respectively) are put on the job of getting the exclusive story of the impending nuptials. Put up to it by their boss, in cahoots with Dexter, it looks as though it is a smear job engineered by Dexter to get revenge on his ex-wife. More than anything the failure of this film rests with the lack of chemistry amongst its actors. Jimmy Stewart, generally seen as a man who could get along with just about anyone, plays a man so filled with melancholy and disdain for the intended subjects of his writing, that he literally makes the worst newspaper reporter ever. His girlfriend, frankly the most engaging character of the piece, Imbrie is stuck watching her albatross of a boyfriend drunkenly stagger through life and falling in love with another woman on a whim. Grant, one of my normal favorite actors of the golden age of cinema, is surprisingly absent from this film, especially given that he is one of the headliners, but what I bristled most at was the transformation of the strong confident woman who was Hepburn’s Tracy Lord, reduced by guilt and criticism to just the sort of brainless weak-willed woman that she worked her entire career to rally against. How dare she want a divorce from a husband who is a un-repentant alcoholic, or be angry at a father who cheats on her mother. How dare she find a respectful, caring, man of considerable means despite the fact that he is not considered “old money”. No wonder she is looked down upon by every other single character in this film, until she is brow-beaten into submission. Each review I’ve read describes her as “snooty”, or “uppity”, and describes her treatment as her having “had it coming”. How refreshing and unique a view. Yuck. I found that I had checked out of this film pretty quickly and found little in the way of redeeming characteristics from that point forward. At most, I can say that I saw this “classic”, and at least I can say that I’d rather have watched something else. I’m a little surprised that George Cukor had so much to do with a film about a bunch of men putting an “uppity” woman in her place, seeing as how he has had a long history of working on films with capable women characters (A Star is Born, Wizard of Oz, and he’s worked with Katharine Hepburn before on Adam’s Rib which I assume falls into that demographic although I haven’t seen it myself). This film was a rather large disappointment to me, and as such is not nearly recommendable, either for me or by me. From the early 30’s on through the late 80’s and early 90’s, when the United States needed someone to look up to, someone to stand strong against adversity, and live up to the wholesome ideals of a bygone era (often regardless of what age they were living in), the world looked to Jimmy Stewart. Perennially playing roles of such strong moral character, and unwaivering goodness, Stewart seemed to me to be a ham-fisted actor. Someone lacking the subtlety to play a real person, instead only able to embody a general sense of good and right. 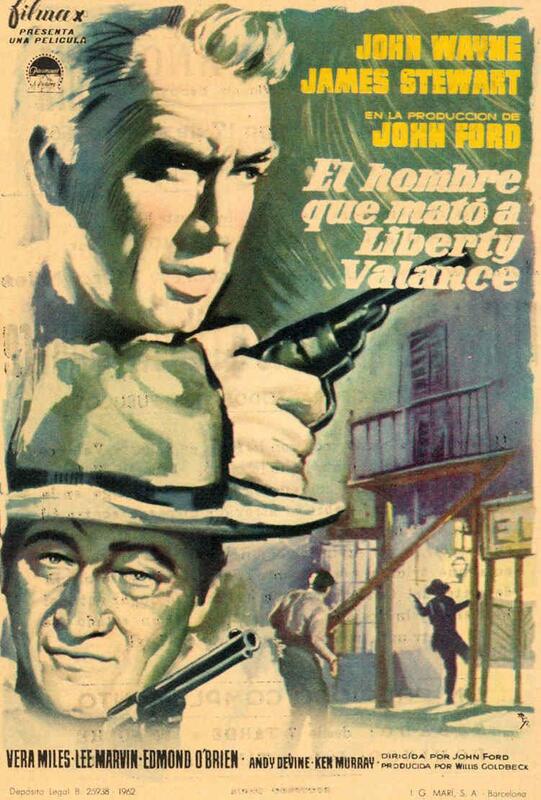 While his career is one filled with good guy roles, and white hats, I may have misjudged Jimmy Stewart the actor. 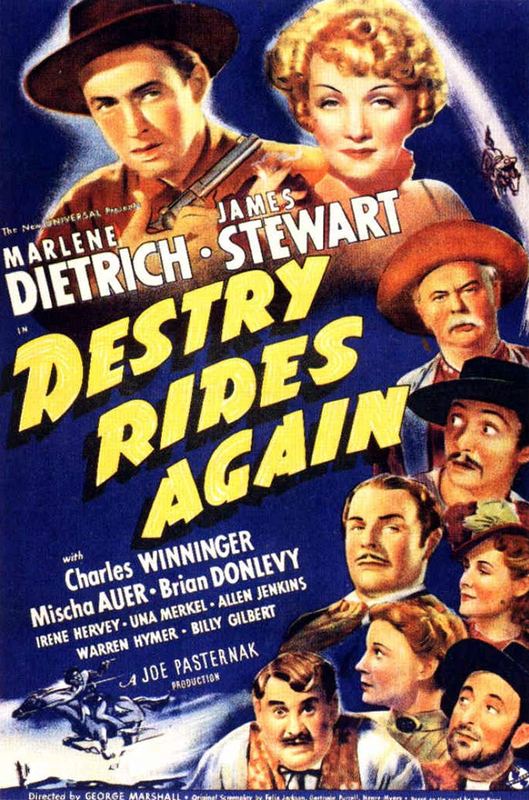 In Destry Rides Again, Stewart arrives in a lawless town controlled by local muscle and kept in line through temptation and booze (temptation in the form of gambling and Frenchy, a saucy burlesque performer played by Marlene Dietrich). It becomes obvious, even in my previous sentence, that he is going to at least attempt to clean things up, and save the cow-like townsfolk from their own vices. He plays Thomas Jefferson Destry, Jr., son of the town’s last good sheriff Destry, Sr.
From there you can just about guess where the story is going to go, Destry arrives, proves himself in corruptible, and is challenged until the very end by the town’s strongman, Kent, played by Brian Donlevy. Now comes the point where the predictable stuff ends… Oh, sure, Stewart is still a good guy, and he has right on his side, and he never gives up, but he does it in a subtle believable way. He doesn’t preach and condemn the actions of anyone. He simply leads through example, shedding the light of day on the depravity to which the townsfolk had grown accustomed. Rather than being smug and arrogant, he was likable and most importantly, a natural. The other huge surprise comes in the form of the character Frenchy. From the very start of the movie Marlene Dietrich plays her as conniving, opportunistic, and self-serving. She clearly moves from town to town taking what she can and moving along when things dry up. Stewart’s Destry presents a huge obstacle to her character’s continued success, and as such it is only natural that she would, at least initially, dislike him. As the movie plays out, these two characters could easily go one of two ways. There can either be a confrontation in which one of them loses everything, or one or both of the characters will change and there will be a romance. I won’t mention here what actually does happen, but rest assured, the movie didn’t let me down. Each of the characters was true to themselves and the only natural conclusion that could have happened did. So, despite being composed of some ingredients that I was less than excited about, Destry Rides Again, surprised me and became far more than the sum of it’s parts. Not necessarily the best movie, nor one that deserves to definitely be on this list, but far better than I anticipated it to being when I started it. I understand why it is that generations of American’s looked to Jimmy Stewart when they needed a hero, I don’t know that the film industry has anyone like him today, possibly Tom Hanks, and we may never have anyone like him again.